This article is published by Mashable, click here to read the original article. The upside to blogging with an iPad is that it’s portable and you can easily log your thoughts on a screen that is a lot more convenient than typing into an iPhone or other smartphone. Also, there are a number of apps to make it fairly easy. The downside is that even though typing is easier on a much larger screen, typing on a screen vs. a tactile keyboard still takes some getting used to, even if you’re an iPhone owner. Here are several tips and tools that you can use to become productive more quickly when blogging using an iPad. WordPress App – The free app for WordPress is handy and is of course a very limited version of the web based version. The advantage of using the app is a simplified view and larger editing area. Basic functions like create, edit and delete of pages, comments and posts is available. If the limited nature of the app doesn’t work for you, the web based version works well too, albeit with smaller text and work area. Bonus tip: Another handy blogging tool for iPad is BlogPress, which now supports updating Twitter & Facebook as well as upload & embedding of YouTube videos. Dragon Dictation – One very handy workaround awkward typing on the iPad is to use speech to text. I had pretty low expectations of Dragon speech to text software but it’s pretty easy to use. You just speak into the microphone on the iPad and then copy the text from Dragon software over into WordPress or wherever it is that you’re blogging with. There might be a few small edits to make, but I found it to be pretty efficient and pretty accurate. Speech to text saves a lot of time and it’s something you can do when typing isn’t convenient. In fact, most of this post was done with Dragon. PhotoPad & Built-In Screen Capture – With many blog posts, I capture images as screen grabs and then do some editing to customize for a particular blog post. iPhones and iPads can easily take a picture of whatever is displayed on your screen by holding down the top and bottom buttons at the same time. The image is automatically stored to your images folder. Then I use the free PhotoPad app to open the image and do basic editing. Upload the image using WordPress and you’re all set. Editing options are very limited and I would love to get other recommendations. Disqus Pro App – We use Disqus to manage comments on Online Marketing Blog, so moderation duties can be handled in part with this app that is made for iPhone, but usable on the iPad. Echofon Pro – What good is writing a great blog post (or dictating one as in our case here) if no one knows you’ve published it? That’s where tools for Twitter and/or Facebook come in. I use Echofon for my Tweeting activities on my iPhone 4 and the iPad. In regards to blog promotion, it’s a quick way to share links to your best posts. There is a Tweetdeck app for iPad too, but I’ve had little luck getting it to work. Analytics App – If you need a quick fix for top level web stats for your blog and you use Google Analytics, then this app comes in handy. Like the other apps on this list, it’s limited, but can offer you info on the go. Will the iPad server as a replacement device for blogging over the laptop? For now: no. The limited features of the iPad apps over their web counterparts means too much switching back and forth between app and browser. 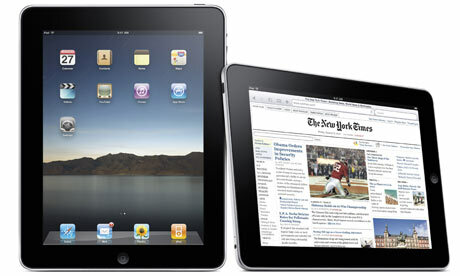 However, the iPad is providing more convenient access to blogging than a cell phone. There are many other apps for iPad and if you have found some that are particularly useful for blogging, please share in the comments. This article is published by TopRank, click here to read the original article.